I am a Date Night Believer! I believe they can change your marriage. We recently started having an in home date night. I believe that even just one date night a month can help you reconnect with your spouse and remind you why you fell in Love with them in the first place! An evening out for a romantic dinner is usually what folks picture when they hear “date night”. I used to picture that too. 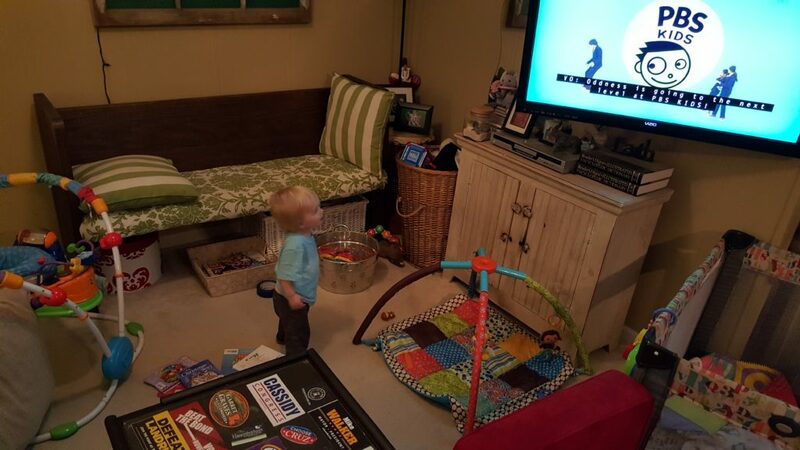 However, our world has been blessed with a little ball of energy we like to call Sarah and date nights have changed. Date nights have changed because we can’t just decide at the drop of a hat to go out for that romantic dinner anymore and we are new-ish parents still figuring out that whole “plan ahead” thing. We also don’t really want to spend $50 – $150 every month on Date Night. We would rather save it for a new vehicle or put it towards retirement. ( That sounded way too grown up! 🙂 ) So, what is the solution? 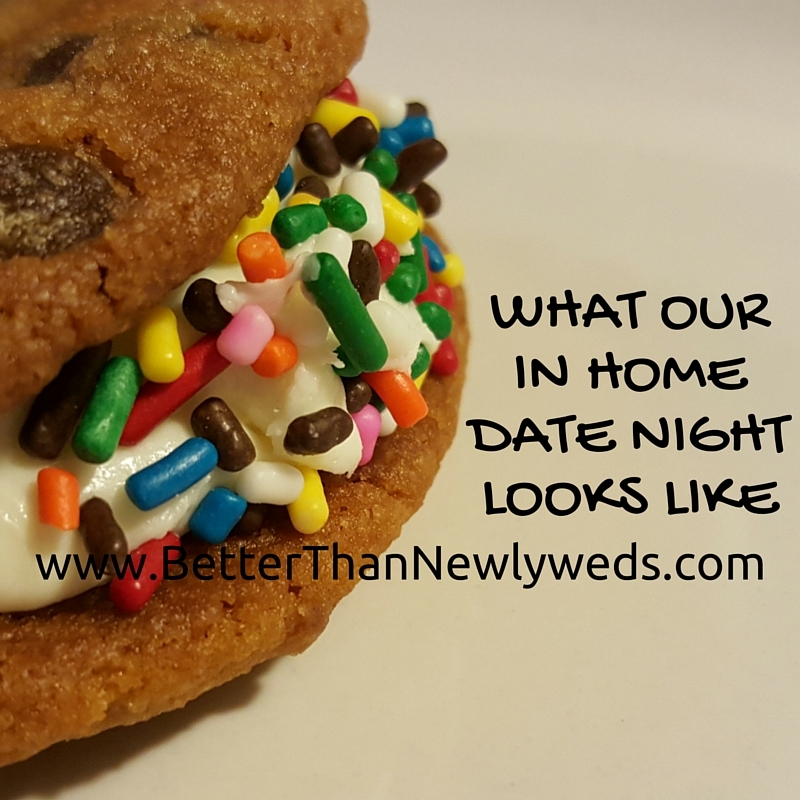 When we don’t or can’t go out we have found that an “in home date night” can be romantic too! Our “in home date night” usually involves us cooking together, a red box movie, and a fun dessert! Our night was pretty simple. It wasn’t about the food but about the time we spent together. Because we were at home we could be silly in the kitchen cooking together and we could pause the movie when we wanted to talk about the movie. Conversation is an important part of a successful “date night”! 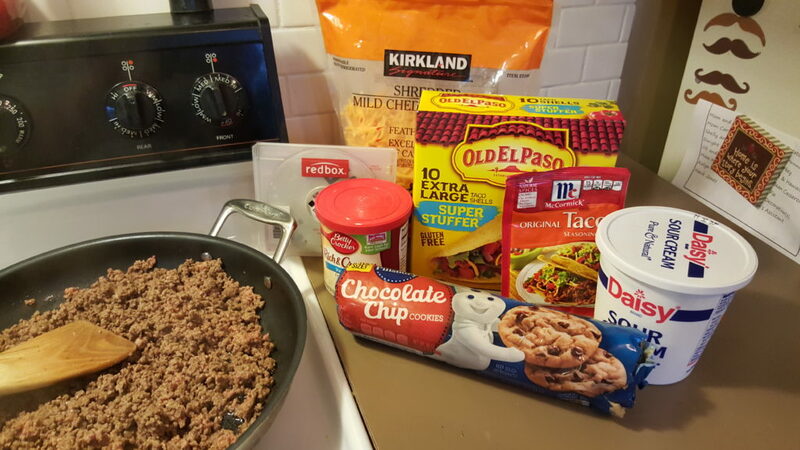 On the menu was tacos and cookies for dessert. 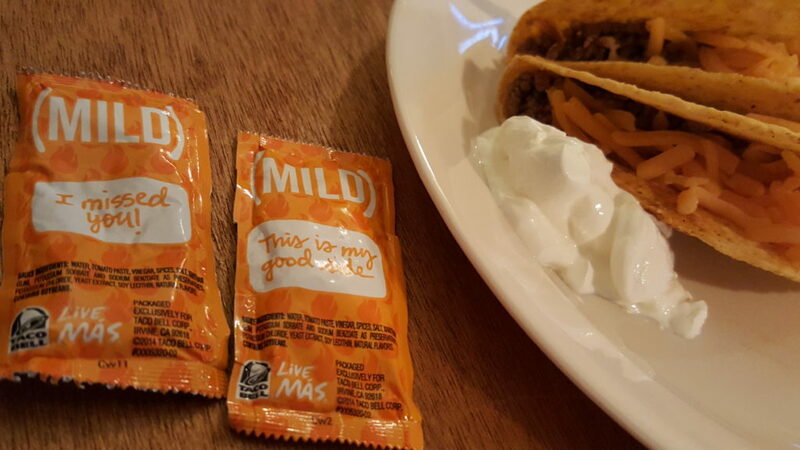 Just for fun I picked out special messages from our stash of Taco Bell sauces to go along with our tacos. 🙂 Why waste an opportunity to be sweet!? It is a special sweet treat! Bake some cookies and then put one upside down on a plate. Then plop some icing on the cookie. Add an upright cookie on top of the icing and squish the cookies together! 😀 Enjoy! And for extra fun… add sprinkles! While we are on the topic of sweet treats! Let’s take a look at the sweet beginning of “man” and “woman” through creation. “Then the LORD God said, “It is not good that the man should be alone; I will make him a helper fit for him.” Now out of the ground the LORD God had formed every beast of the field and every bird of the heavens and brought them to the man to see what he would call them. And whatever the man called every living creature, that was its name. The man gave names to all livestock and to the birds of the heavens and to every beast of the field. Sometimes my husband calls me “his rib”… at first it was a quirky term of endearment. But now it is sweet. It reminds me that from the beginning God knew. God knew what I would need in a husband and so he created Dwight for me. He also knew what Dwight would need in a wife and created me for him. God didn’t just stop at our needs though He blessed us with many things we didn’t even know we would want in each other! Isn’t it great to have a sweet God like that? I pray today that every husband would “hold fast” to his wife. I pray that husband and wife would operate as one flesh in agreement with His word. I rebuke every scheme of the devil and declare that all his plans to bring division must stop in Jesus’ name. May we rest upon His word and His truth and know that the same power that raised Jesus from the grave lives in us. Jesus, help us to stand up and put the devil under our feet where he belongs. Help us to stand up for our marriages and operate as one unit against the enemy. Help us recognize his schemes and submit to you all that we do so that when we resist the devil he must flee! Thank you for who you are God. Help us Love like You Love. Amen. Pazookies, yes they look so good! I will try them, A wonderful date night idea! They are so good! But be careful they are addicting! 😉 Please let me know if you try this date night idea! I would love to see pictures of your own pazookies! Send pics to BetterThanNewlyweds @gmail.com 🙂 Thanks for reading and share with a friend if you can! It is so important to have time alone together with your spouse. It gets harder after there are children. We have two special needs teens/young adults. We make time for each other while the kids are sleeping. Sometimes this means waking up at odd hours. But, it is essential for a healthy marriage. Enjoy one another! You are so right that it is essential! Just like time with Jesus is essential for that relationship so it is with our spouse. 🙂 Thanks so much for reading and please share with a friend if you can!